Every month it makes an appearance, it's the unwelcome visitor to women around the world and it's pretty much one of the worst ways to spend up to 7 days of your life. That's right, I'm talking periods today. When it comes to period talk it seems to be a bit of a hush hush subject. My friends and I never used to talk about it, yet I would read stories of women talking about it together and it's usually depicted that way in the movies; that we sit around talking about when we are due, our symptoms, coming to each other's rescue and if I'm honest, I always wanted to have the period chat with my friends. It's such a big part of our lives and it would be nice to know if it's normal to cry for days before "aunt flow" is due or to eat my gran out of house and home for about two weeks before then starve myself when it finally appears, so when my friends and I started talking about it in a group chat I was relieved to know that I wasn't the only one who thought about strangling everyone around me when the mood hits and crying about wanting attention at 4am in the morning! First off, the week before Mother Nature hits me with this blow I make sure to stock up on everything I'll need because when it hits, I'm usually bed bound for a few days and don't feel like moving from the comfort of my own home. I'll make sure I have pads, plenty of pain killers, chocolate, lucozade, baby wipes (but I always have these) I put spare pants in my drawer in the bathroom for easy access and I have the hot water bottle to hand. 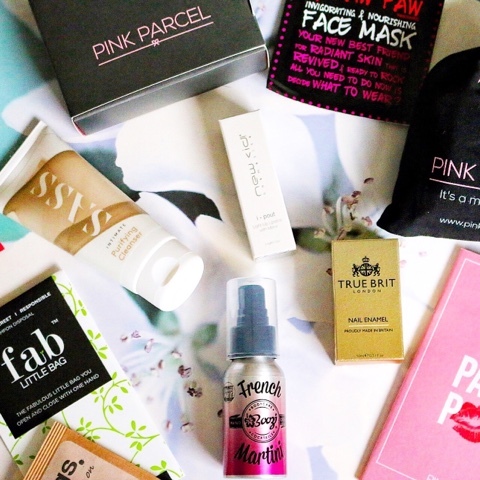 I have also subscribed to Pink Parcel to give myself a little treat around period week and wow, what a treat it is! I would definitely recommend it. When it comes to dealing with the pain I take dehydracodine. I used to take ibuprofen based pain killers but unfortunately my body started to react really badly to them so because I'm already on dehydracodine for my back and hips, it just makes sense to take these for my unbearable period pain. I also buy in Panadol for when the pain isn't so bad and this seems to work for me. Having energy drinks in the house always helps because I feel drained of any energy when I'm on my periods, so to help me get that extra boost I stock up on red bull. Fresh bed sheets are always a bonus when it comes to this time because it's great to sleep in complete comfort as that's where I spend most of my time when the pain really hits. Hot water bottles are a true savior for me, that and a lovely warm bath to soak in with some muscle relaxer. The heat is my best friend at this time. For me, periods are a horrific time because I'm always in pain, I'm always crying and sometimes black out, but I know that some people don't experience this and will probably think I'm over reacting, but believe me when I say I'm not. I have often been challenged on this by people that have called themselves my friends at one point in time or another and when they have witnessed me physically pass out because the pains gotten so bad, I've had apologies at how wrong they actually were. So if you're one of those people, just like me who have a horrible experience, I hope you have a routine that works for you because its really not great. I'm the same way. My cramps get so bad I usually throw up the first 24 hours, i want to eat everythinh ir nothing, oh it's great. This is a pretty cool box! It's horrible isn't it? I can't stomach food whilst I'm on and my one little luxury of chocolate is starting to make me sick. Horrible time. It's great eh? Such an awesome box. I'm on the implant and originally I didn't have any periods (felt very smug) But now mother nature is back with vengeance and my last period lasted 3 week! It's great to see suggestions of how to ease it! I take cocodomol for the pain. I'd never thought of energy drinks! So may try it. I've found mine have got worse as I've got older and are definitely worse since having kids. Is that the same for you? I used to take Co-codamol as well but it started making me feel worse. I'm going through a lot right now with bleeding and I feel like it's never ending, absolutely hate it! At first it was better since having my son but now it's really bad, don't know if it's anything to do with my coil or not. I used to have a nightmare with mine when I was a teenager (although nothing compared to blacking out with pain!) I went on the pill and I've never looked back. I barely get any pain or emotional upheavel and they're generally very light. I cherish my hot water bottle for sure! Yeah the treat box is great! Nice pick me up for sure, such great value for money as well!